That’s according to the Q2 2017 Small Business Sentiment Index from National Write Your Congressman (NYWC). The survey found an overwhelming majority of small businesses (95 percent) saying they would like Congress to act on tax relief and simplification. Small businesses are also looking forward to some other big economic reforms. Regulation reduction (90 percent), federal budget and debt reform (86 percent) and healthcare reform (79 percent) are especially relevant, the survey found. “There is great opportunity for Congress to come together to improve their track record of action. Individuals are more active voicing their opinions on the economy and are ready for Washington to do their part,” said Joshua Habursky, Director of Advocacy for the Grassroots Professional Network in a release on the survey. A large number of small businesses (62 percent) said they believe their own elected members of Congress know the opinions of their constituents on important issues. Only 22 percent, however, feel Congress is working hard to improve the economy. 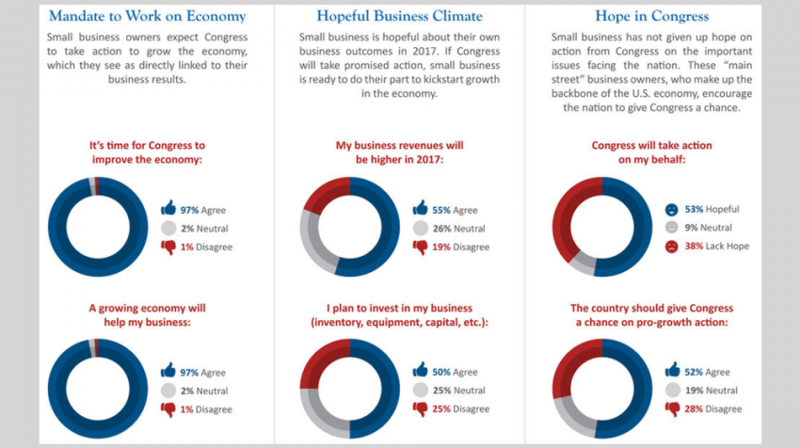 It’s worth noting that 53 percent of small business owners responding are hopeful that Congress as a whole will take action on their behalf in 2017. NWYC is a privately-held, nonpartisan membership organization made up of small businesses. NWYC’s Quarterly Index measures small business owners and operators’ sentiments towards Congress and their confidence in the U.S. government. The Q2 2017 Index is the fourth contiguous study in the research series. For the study, NWYC collected data from 1,414 respondents from within its membership.